You are the Ocean and I am a river. I am the trifling tiny droplet. I am your Spiritual child. (At last) I found the Glorious Knower of All Things. I recognized my Lord Shah Karim. And this is how my Shahdatar excels above all. Such you are the Generous Lord. Such you are my Compassionate Lord. You are the best of all the guardians, the Benevolent. What humble gift can we present to you? O! the Provider of Abundance. We shall offer all and everything. I have become ecstatic (in your love). 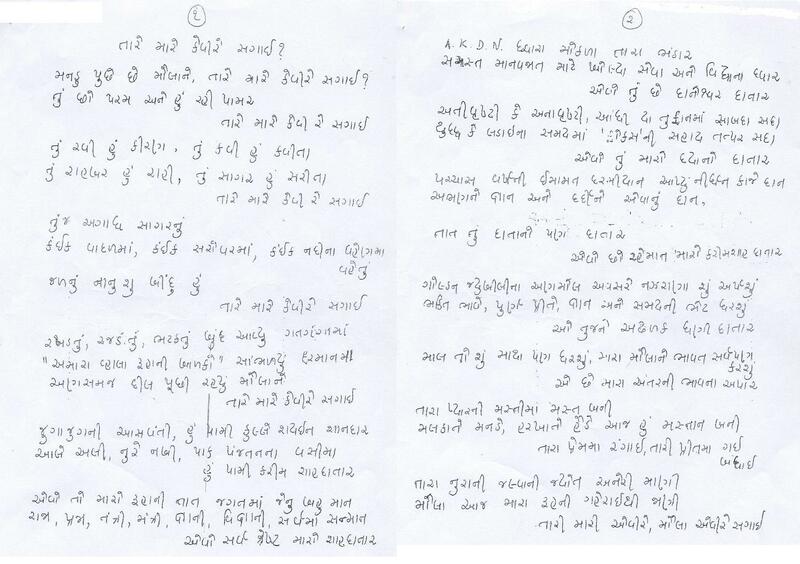 Maherun Nisa Pradhan’s poem Tare mare kevi-re Sagai?” was in Gujarati. The above is an English translation.